An open-plan kitchen suits today’s informal lifestyles, providing a natural hub for the home for socialising while providing easy access to the kitchen. It also allows the family to be together in the same space where the kitchen area transitions seamlessly with the dining and living areas. 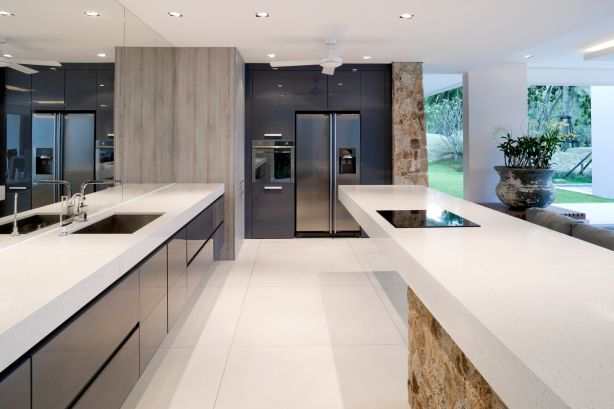 Knocking down a wall will not only open up your space, but it will provide more options for your kitchen layout you choose, and the size and position of appliances, benchtops, and island benches. Alternatively, if you prefer to keep your existing layout, you can refresh your kitchen by painting or replacing cupboards and doors, updating fixtures such as handles, and hinges and replacing benchtops, sinks, and tapware. These are easy to replace and a simple way to make an impact. You might also try replacing your kitchen splashback with new tiles or glass. While you’re considering your splashback options, consider replacing or adding powerpoints and switches. Think about the number of switches you need, and whether you need (or would like) integrated internet chargers, wireless charging or remote digital capabilities. When you think about everything we ask of our kitchens these days, investing in a good one makes sense.